An education in anthropology encourages us to look beyond cultural assumptions. In the days following the results of the US presidential election, there has allegedly been a wave of racist attacks and hate crime across the States against Muslims, hispanic Americans, black people, ethnic minorities, and the LGBT community. At the root of such behaviour is deep cultural ignorance and education is one of the most powerful weapons we have against intolerance and fear of the ‘other’. The humanistic sensibilities that an education in anthropology fosters can be paradigm-changing. It seems apparent that a commitment to an engaged public anthropology has never mattered more, or been more feasible in this digitally connected age. Many anthropologists, including the Why We Post team, feel the moral and political imperative to bring anthropology to a wider audience than was previously possible with traditional modes of research dissemination. But as anthropologists situated within today’s hyper-competitive academic job market, how can we navigate the often tenuous balance between public and academic output? 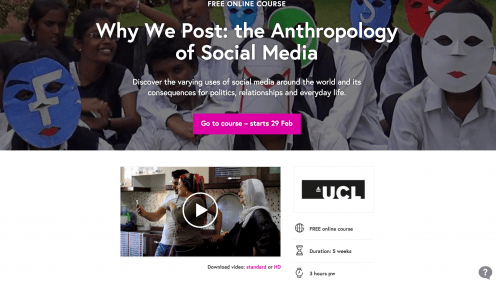 The Why We Post course on FutureLearn runs three times per year. I believe that there are several factors that enabled our team to successfully produce large amounts of public output at the same time as writing up their research, publishing, and applying for jobs (all of the 5 post docs have now secured academic employment). Firstly I think it’s important that public engagement shouldn’t be an afterthought to research, but like with Why We Post, should begin from a project’s inception if it is to be successful. Partly this is because the writing skills necessary for communicating to a general public take time to hone, and also because it’s important for researchers to understand early on in their work the kind of field material (video, photographic, textual) they need to record in order to produce engaging content that will appeal to non-anthropologists. 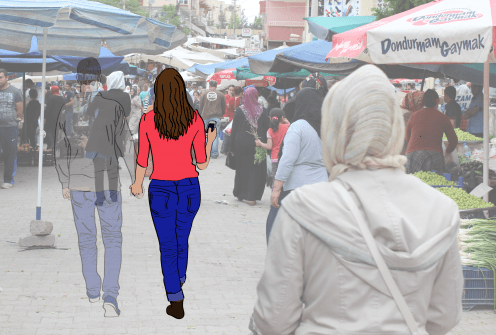 Given our topic of research is the uses and consequences of social media, our project was conceived as having a broad appeal from the outset; with selfies and memes we might be able to bring people to anthropology who otherwise might overlook it. Project leader Daniel Miller envisaged a spectrum of dissemination/engagement methods including open access books, an e-course, and a public-facing website, all of which was made possible by a generous ERC advanced grant which funded the project and has covered my salary as a public engagement fellow and research assistant. I was hired at the three-and-a-half-year mark when the team were in the process of writing up. Working with these talented researchers to produce our public content I saw how it was often difficult for them to juggle the academic and public output, even with the support of a team. The more conversations I had with them, the clearer it became: public engagement in anthropology is currently institutionally undervalued and needs greater recognition within the established modes of evaluation that researchers are subject to. I think that projects with more limited resources than ours would struggle to produce the same range of public output, despite the best intentions of individual researchers to reach beyond the ivory tower. 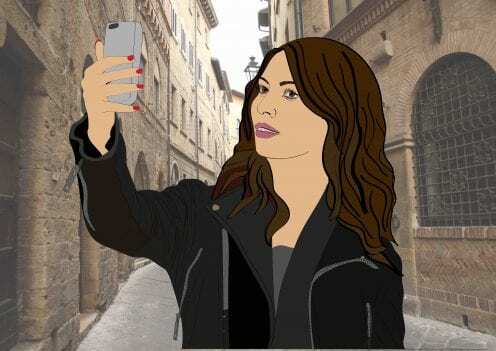 Can we draw people to anthropology through analysis of popular culture such as the selfie? In addition to writing 11 open access books (aimed at both academics and lay readers, with jargon-free text and references kept to footnotes), the Why We Post team agree that producing visual and textual material for the online course was the most time-intensive of our initiatives, taking longer than expected. One of our researchers, Shriram Venkatraman believes that this was mainly down our high production values coupled with our lack of experience in creating such material – and a lack of existing models to follow. 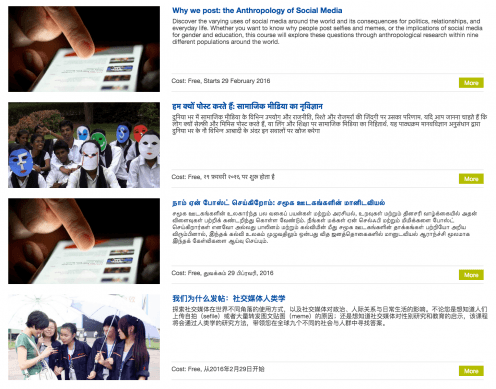 We were the first UCL course on FutureLearn and the first comparative anthropological online course of this scale. The sheer amount of material coming from our project also posed a challenge – how do you condense insights from a total of 135 months of ethnographic fieldwork across nine fieldsites into a concise course aimed at a general audience? The answer: a combination of Googledocs, tracked edits, miles of emails, and a lot of good will and humour. Support also came from UCL’s Digital Education team whose expertise in online learning was pivotal in developing a successful course. Our course is available in the 7 languages of our fieldsites on UCLeXtend. It is heartening to see other efforts towards quality and sustained public anthropology, such as the founding of the Public Anthropology Institute (PAI) at Wesleyan University, and we hope that such initiatives garner wide praise among anthropologists. We have a duty to promote the kind of cultural sensitivity that anthropologists take for granted to as broad an audience as possible, so that people who see cultural difference as a potential source of anxiety, might come to appreciate, and even delight in, the multitude of ways there are to be human. Thanks to the Why We Post team for sharing their experiences of the public engagement balancing act. Also thanks to our lively panel at IUAES (Berna Yazici, Laura Korčulanin, Miha Poredoš, Aivita Putnina, Branko Banović, Margarita Barrera, Helleka Koppel, and Pascale Hancart Petitet) who continued conversations with me beyond the conference, and who are involved in projects ranging from public art installations of golden excrement in the ‘Give a Sh*t’ project, to an anthropological radio show in Laos.